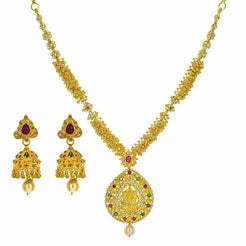 4.33CT Bisou Heart Diamond Necklace & Earrings Set in 18K Yellow Gold W/ Centre Ruby for women. Necklace features two tone bone link chain which is followed by a yellow gold heart link frame leading to the pendant. The pendant has a centered precious ruby which is encased by mulitple heart shapes that lightly kiss each other. 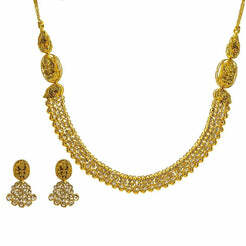 Both necklace and matching earrings are set with brilliant sparkling diamonds. Earrings feature a screw back closure. 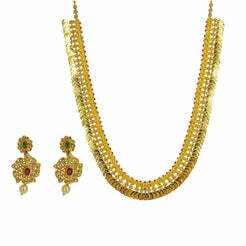 Perfect occasional and bridal wear jewelry set. Gold weight is 35 grams.